Last Updated: January 30, 2019 · Published: June 18, 2018 By: Asian Caucasian 2 Comments This post may contain affiliate links or sponsored content. 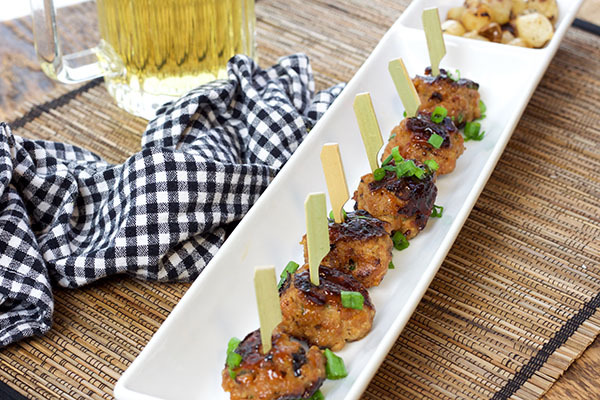 Fire up the grill for these drool-worthy, gluten-free Sweet and Spicy BBQ Meatballs! 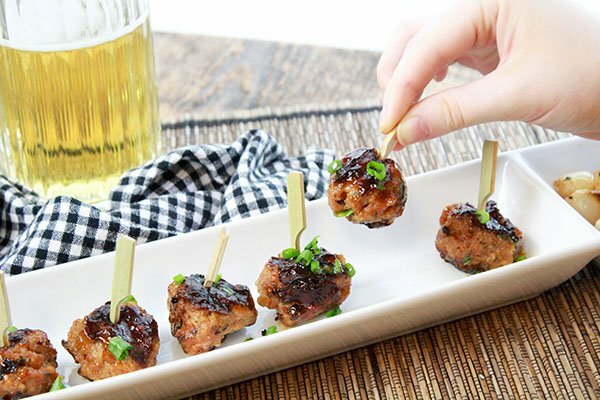 These are the best Asian-inspired meatballs you’ll ever put in your mouth! They’re made with ground pork and ground turkey, herbs and seasonings, and brushed with a super simple glaze of classic flavors. These meatballs grill to perfection! You can grill them on or off the skewers. Honestly, they can break if you don’t have a thick enough skewer for these meatballs, so you can just cook them right on the grill pan. I suggest using a grill pan instead of placing them on an open grill so they don’t fall through. The best part of this starter dish is the glaze for drizzling. I threw on some pearl onions to caramelize and they paired nicely with the meatballs. You can use a thick veggie like zucchini if that’s your thing. 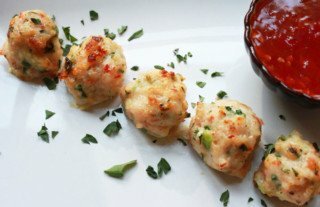 I like to serve these as an appetizer with little baby skewers spiked into each meatball. These Sweet and Spicy BBQ Meatballs will WOW your tastebuds! Holy Meatballs, Batman! 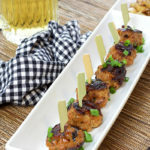 No kidding, these Sweet and Spicy BBQ Meatballs are to die for! Serve these at your next BBQ or dinner party and get ready for some ultimate praising! How do I make the meatballs? You’ll need a large mixing bowl to combine the turkey, pork, garlic, green onions, sambal oelek, red curry paste, gluten-free soy sauce, sesame oil, egg, cilantro, and bread crumbs. Mix until mixture holds together well. and form into 25 two-inch round balls (I like to use a small scooper to make the meatballs uniform in size). Then thread the meatballs onto metal or wooden skewers with pearl onions in between the meatballs (about 3 meatballs per skewer). Place the skewers on an oiled grill rack or grill pan, turning to brown on all sides until cooked through, about 8 to 10 minutes. Brush the meatballs with the glaze about halfway through. Remove skewers from grill and spoon more glaze over the meatballs. Delish! I like to use a small scooper to form the meatballs so they stay uniform, making 2-inch meatballs. Place the meatballs in the freezer to firm up before threading onto skewers. 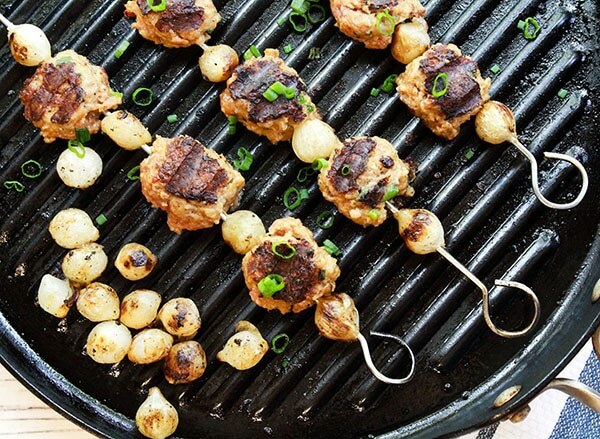 Grill up these meatballs on metal or wooden skewers with pearl onions in between. I think using a grill pan keeps them intact. So much love in these meatballs! The flavor is incredible and the glaze is great on just about any protein! 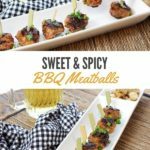 These best ever Sweet and Spicy BBQ Meatballs are perfect for summer grilling! Make the meatballs: In a large mixing bowl, combine the turkey, pork, garlic, green onions, sambal oelek, red curry paste, soy sauce, sesame oil, egg, cilantro, and bread crumbs. Mix until mixture holds together well. 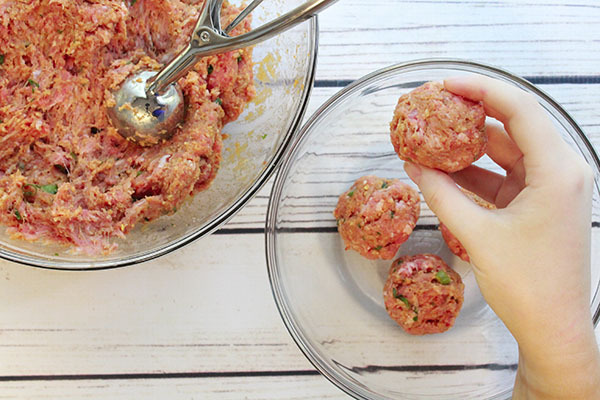 Form into 25 two-inch round balls (I like to use a small scooper to make the meatballs uniform in size). Place the meatballs into the freezer for about 10 minutes. This helps to keep the meatballs firm for threading onto the skewers. Remove from freezer and thread the meatballs onto metal or wooden skewers with pearl onions in between the meatballs (about 3 meatballs per skewer). Make the glaze: In a small mixing bowl whisk together the soy sauce, Sriracha, honey, and brown sugar. In a separate small bowl whisk together the cornstarch and water until dissolved. Add the cornstarch mixture the sauce mixture and combine well. Place the sauce in a small sauce pan over medium-low heat. Cook, stirring constantly, for about 3 to 4 minutes until the sauce starts to thicken into a glaze. Do not overcook or it will burn and be too thick! Remove from stove and set aside, stirring occasionally. Grill the skewers: Place the skewers on an oiled grill rack or grill pan, turning to brown on all sides until cooked through, about 8 to 10 minutes. Brush the meatballs with the glaze about halfway through. Remove skewers from grill and spoon more glaze over the meatballs. Serve with pearl onions. Garnish with green onions. It’s hard to go wrong with meatballs! I always love the combination of turkey and pork. Definitely one of my faves. This looks like just the right amount of spicy for me. Well you have the best spices, Mike! Wish I had some for my grilled meatballs.